JANETTA FRANCIS KEITH was born November 1893 in Concho County, Texas. She was the first child born to WILEY H. KEITH and EMILY CATHERINE HOLLIDAY. She married CHARLES DENMOND CHAPMAN July 04, 1907 in Menard County, TX. He was born April 09, 1876 in Llano County, Texas. He was the son of Benjamin Lawrence Chapman and Rose Ann Jackson. KATHRYNE LUCILLE CHAPMAN b. Abt. 1911 in Texas; m. CHRISTIAN HOODE SNODGRASS Abt. 1929. CHARLES DENMOND CHAPMAN b. January 27, 1913 in Menard County, Texas; d. October 22, 1979 in Tom Green County, TX; m. ROSE WILSON 1938 in DeLeon, Comanche County, TX. WANDA N. CHAPMAN b. Abt. 1915, Menard County, Texas. MAYBELL CHAPMAN b. Abt. 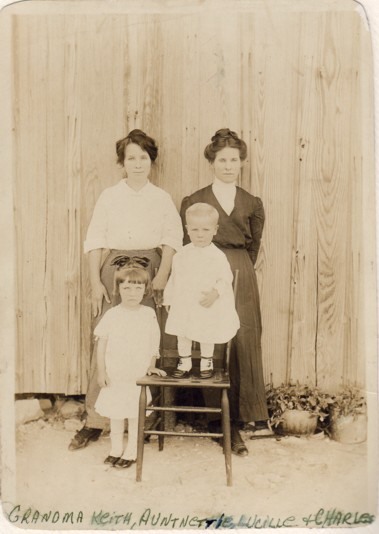 1917 in Menard County, Texas; m. JAMES ROY CHADWICH. HARLAN CHAPMAN b. September 18, 1919, Menard County, Texas; d. 1981, Texas.